What IS the San Francisco Free Folk Festival? The festival is two full days of music and dance workshops, concerts, dance parties, crafts, vendors, formal and informal music-making, and just plain fun for the whole family. All ages and musical interests are welcome. All events and workshops are open to anyone who wants to drop in and participate or just listen. And did we mention that admission is free? How can the festival be free? We rely solely on donations to cover the cost of renting the facility, plus other expenses. All of the performers donate their time and talent to create this event. Many of the performers and workshop leaders are members of the Folk Music Club. There are other ways to support the festival. The Folk Club and most performers sell merchandise, we have a marketplace with musical and craft vendors, plus onsite food and coffee vendors. A portion of the proceeds from the vendors is donated to the Folk Club, so the more you spend, the more it benefits us. And we’ll have a raffle: you can win some nice instruments, CDs from participating musicians, gift certificates, and other prizes! Since everyone involved are volunteers, we can always use more help. Go to See the Volunteer Page for more information more details, or just email sffff-volunteer@googlegroups.com with your contact info and interests. Who has been doing this for 36 years? 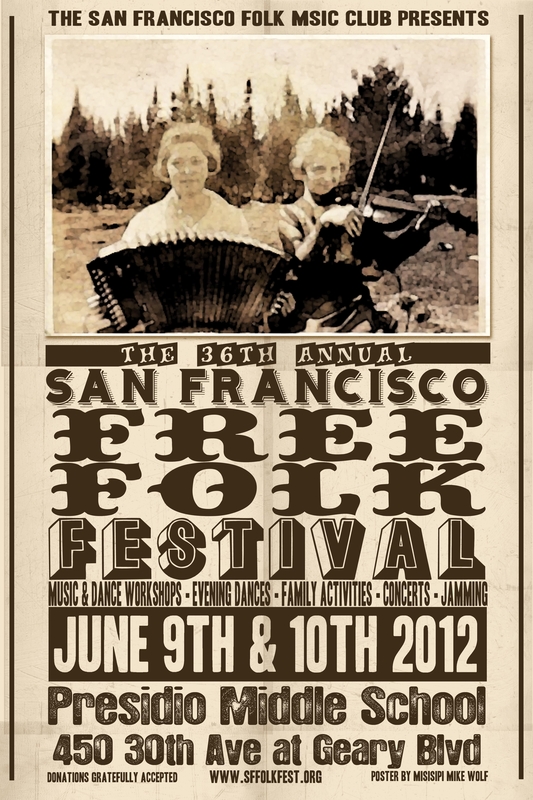 The San Francisco Folk Music Club is a local non-profit organization that was founded in 1948, and is still going strong. Membership is open to anyone. Read a little about the Festival's history, and festival sponsors. I have a few more questions. How can I get in touch? Here's the contact information for the planning committee.